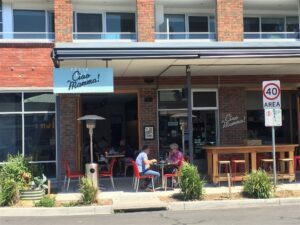 Ciao Mamma is a Coeliac Australia accredited modern and casual Italian eatery, just off Sydney Road in Brunswick (4 km north of Melbourne CBD). The menu is one page, with a choice of starters, pastas (you choose your pasta type and then the sauce to go with it), some sides and sweets. 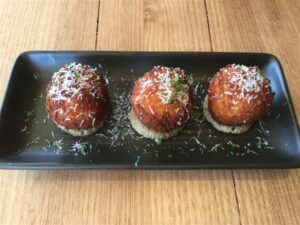 My husband and I shared the roasted pumpkin and basil arancini balls to start, which were perfectly cooked and made even better by the delicious mushroom sauce they were sitting on. I also liked the sound of Nonna’s chips (fried red capsicum). All seven pasta sauces are gluten free and two of the six pasta choices are vegan and gluten free (the gnocchi and the casarecce). They can also do Low FODMAP (no onion or garlic) with advance notice. When I visited, there was also a gluten free pasta special, which was green fettucine. I topped that with my favourite sauce, amatriciana, and it was a lovely dish. 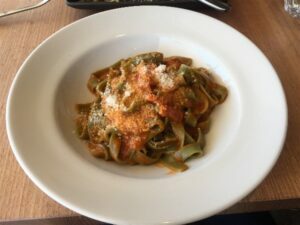 Being Coeliac Australia accredited, I didn’t need to check that they would cook the gluten free pasta safely, which takes away much of the hassle of having to eat gluten free. Four of the six desserts are gluten free, which are an almond and chocolate cake, nutella mousse, panna cotta and caffe crema. The cake is on display and it looked very tempting. Ciao Mamma had a good vibe on a Saturday lunchtime and I’m sure would have a similar feel in the evening. It is a fully licensed venue if you want a glass of wine with your meal. There are a number of outside tables to enjoy the sun and being on a side street it is nice and quiet. 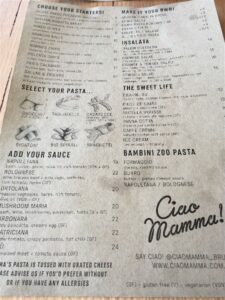 I definitely recommend visiting Ciao Mamma for great gluten free Italian food in Melbourne. 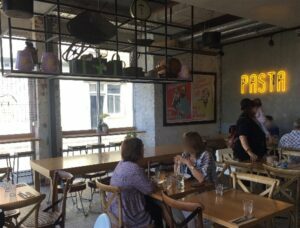 As with many restaurants, a coeliac diagnosis in the family drove them to make their venue safe for coeliacs, as they recognise how difficult it can be to safely eat out. It is close to Jewell station and the no. 19 North Coburg tram (from Elizabeth Street in the city), stop 20. It is only a 20 minute tram ride or 15 minute train trip from the city, so it is easy to get to if you don’t have a car or want to have a few drinks. Tues-Wed 5.30-9.00pm, Thurs 12-3pm & 5.30-10.00pm Fri 12-3pm & 5.30-10.00pm, Sat 12-3pm & 5.30-10.00pm, Sun 12-3pm & 5.30-9.00pm. Closed Mon.